Editor’s Note: A previous version of this story erroneously reported that the Arizona Board of Regents was to meet Wednesday. MESA – Days after Arizona Board of Regents Chairman Mark Killian threatened to sue over funding cuts, Gov. 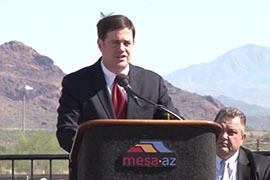 Doug Ducey said Monday he is proud of the budget and wants to work with regents and university officials. The budget Ducey signed last week includes $99 million in cuts to Arizona’s three public universities, a 13 percent reduction in state funding. Other cuts include ending state funding to Maricopa and Pima county community colleges. Speaking at the Special Devices Inc. groundbreaking here Monday, Ducey said he is proud of the budget and is looking forward to Arizona’s future. Afterward, he said the university cuts were hard to make. In an interview with 12 News, Killian said that the cuts violate the Arizona Constitution’s provision calling for university education to be as nearly free as possible. He said the board will discuss the cuts before making any decision on legal action. Killian didn’t respond by late Monday afternoon to an interview request left with a Board of Regents spokeswoman. Ducey said despite the funding cuts he wants to work with the Board of Regents and university leaders. As governor, he is an ex-officio member of the board. Arizona State University President Michael M. Crow has been outspoken in his opposition to the cuts, calling them a “setback for Arizonans” in a statement issued March 7. “This budget cut is being implemented without input from the state’s higher education leaders, and it reverses the progress made in recent years to move our colleges and universities to a performance-based funding model,” Crow’s statement said. ASU funding will be cut by about $54 million. Northern Arizona University President Rita Cheng addressed the $17 million budget cut to the university in a letter to the campus on March 11. Cheng said in the letter that NAU has withdrawn its plans to build a facility for engineering capstone design projects despite a “glaring need” for it. Although many have spoken out against the cuts, some groups have voiced their support. Thomas Grier, a spokesman for Prosper, an organization dedicated to Arizona and prosperity, said the group supports that the budget is balanced and doesn’t involve tax increases. Every aspect of the recently approved state budget has its supporters and critics. But the most intense opposition has been to $99 million in cuts to public universities. Cronkite News asked Gov. Doug Ducey for his reaction to the critics. Gov. 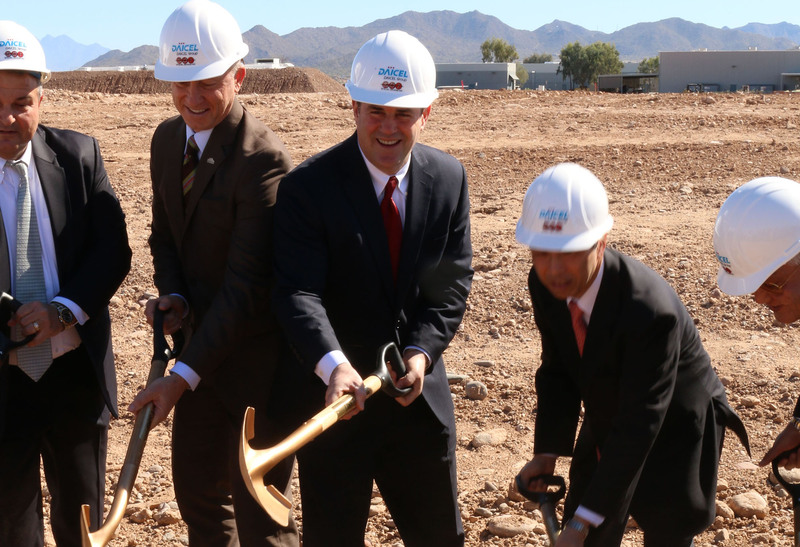 Doug Ducey, pictured here at a Special Devices Inc. expansion groundbreaking in Mesa on March 16, says he’s proud of the budget he signed last week that includes $99 million in cuts to universities.